This post is all about query letter format, a perennially popular topic that won’t quit! While there isn’t just one query letter format or query letter template out there, I’ve developed a handout that I’ve used over the years to really streamline and clarify the process for writers. Click this image to download my query letter format and query letter example PDF! From my recent webinar on query letters, I’ve learned that writers continue to be fascinated with this little one-page document. It’s my most popular webinar by far, and a constant fixture of Google searches about writing. But what makes successful queries? And can I get a query letter template? Writers are desperate for query letter examples. Now I’m making that handout (only spiffier) available to you, no conference attendance required. Click this link to download the PDF. Writers are also curious to see if there is a query letter template that they should be following for formatting their query letter. Is there a set formula for writing a query and organizing the information? Not really, unfortunately. Even if I was going to call my query letter template the perfect way to write a query, many writers wouldn’t get the memo and the slush would still be filled with queries that don’t follow this flow. But I believe very much in my query letter template, which you’ll find in the second page of the PDF. It has a nice flow to it, and is a good way to organize all of the elements of the query letter. The handout includes a query letter template on the second page. Click this link to download the PDF. Here’s something to keep in mind about writing a query letter: IT’S A ONE-PAGE COVER LETTER. Your query letter length? 250 to 450 words. That’s it! Sure, it feels so much more monumental than that, but the query letter only has one job: To get the agent or publisher interested enough to move on to your writing sample or proposal. That’s it. That’s all. Writers obsess over the query letter. It feels like their “one shot” to achieve publication. Their foot in the door. But believe me when I say that I never offered representation based solely on the query letter, and I have overlooked many crappy queries to then offer on a great manuscript. The query is a means to an end. 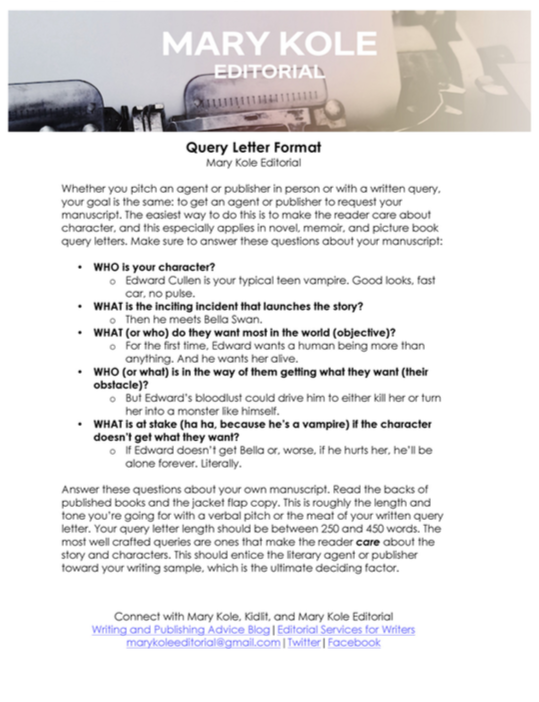 I hope this query letter format tool helps you work on your query writing. However, if you’re asking some variation on “how to get my novel published,” I want to make sure you keep your focus where it belongs: on crafting an amazing manuscript. As a book editor, I work on everything from queries and book proposals to complete novel and memoir manuscripts. If you’d like personal advice on your own pitch or manuscript, reach out! After a conference, when we get the list of editors and agents to whom we may submit and the agent’s info specifies full ms for picture books but no other details, is a full query letter expected as well?